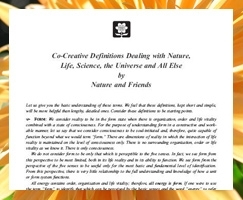 Co-Creative Definitions - Perelandra Ltd.
Machaelle "sat down" with nature years ago and asked for definitions for a number of terms we use often in the Perelandra writings. They include: form, nature, devas and nature spirits, consciousness, soul, energy, basic sensory system perception, reality, perceived reality, balance, life vitality, grounding, intent and intuition. I recommend this paper to everyone, especially if you thought you already knew these definitions! It gives an excellent foundation for a co-creative partnership with nature and an amazing perspective on these terms. NOTE: Some of these definitions are included in The Perelandra Garden Workbook, and all of them are included in the third edition of MAP.